Summer Camps Keep the Kids Busy! The school year’s impending end is a sure sign that the time for summer camps is right around the corner. Marco Island has an assortment of camp options that offer the community’s youth the opportunity exercise, gain knowledge and burnish skills through hands-on activities, have fun and make new friends as those lazy, hazy days of summer wend their way toward the fall. The City of Marco Island Parks and Recreation Department’s Camp Mackle is a multi-faceted program for children in kindergarten through fifth grade. Camp Mackle runs from 7:30 AM to 6 PM, June 4 through August 14. The cost, on a per-child basis, is $20 a day, $80 a week or $700 for the full summer. Now in its sixth year, Camp Mackle’s 2015 theme will be “Living in the Land of Imagination!” Campers will be treated to guest speakers and presentations, field trips, specialty craft projects, games, athletics and other valuable experiences. Activities are based at Frank E. Mackle Community Park, located at 1361 Andalusia Terrace. Activities kick off on May 30 with the Parks and Recreation Department’s Celebration at the Beach, which marks the school year’s end, and the beginning of summer for the island’s teenagers. There will be music and food, games and activities from 1 PM to 5 PM. The department also offers a special camp-related program entitled L.I.T. – Leader In Training – for youths in ninth through twelfth grade who serve as volunteers working with the youths who take part in Camp Mackle. L.I.T. provides the opportunity for volunteers to rack up school volunteer and community service hours, or to simply engage in something productive and creative during the summer. Paddle Boarding, which will run from 1 PM–3 PM, July 13-17th at the Isle of Capri Paddle Craft Park. Children must be at least 10 years of age and the cost is $110 per child for residents and $132 for non-residents. Fishing Camp 101, for children ages 9-12. The camp will run from 9 AM -1 PM, Aug. 3-7, at the Mackle Park Teen Center. The cost is $85 for residents and $102 for non-residents. The camp will cover the basics of casting, knot tying, tack gear, fish identification and more. A jewelry camp and art classes will be held at the teen center, but schedules are still being developed. The Marco Island Community Sailing Center will again have a full slate of youth summer programs, starting on June 8 and ending on August 14. The sailing center is located at the Marco Island Yacht Club beach. Youths must be at least 8 years old to take part. Prices vary, depending on the program. For more information or to register, visit cityofmarcoisland.com/index.aspx?page=373 or call (239) 642-0575. There will also be an open house and sailing regatta at the sailing center on May 16. The open house will be held from 11 AM-2 PM and registrations will be taken then. The regatta is set for 2 PM-5PM. The annual Police and Fire Academy for youths entering sixth through eighth grade in the fall is set for June 8-June 12. Held from 9 AM-2 PM, at the police department, the cost is $40 for residents and $48 for non-residents. Hosted and staffed by the city’s police and fire departments, the week-long course introduces youths to the day-to-day duties of the community’s emergency services personnel. Enrollment is limited to 15 children and that total is reached every year, said Chris Bowden, a firefighter-paramedic and the Fire-Rescue Department’s Public Education Coordinator. “I think it’s a fun way for the kids to see what police and firemen do on a daily basis, whether it be checking out the trucks in the morning to performing aerial rescues,” Bowden said, in explaining the camp’s popularity. He said it’s common for some children to sign up each year they are eligible. The Greater Marco Family YMCA will base the Marco segment of its annual summer camp program at Marco Island Charter Middle School this year, while construction continues on its new $1.2 million youth development center, which should be completed for the start of the new school year. Camps are also held at Lely, Avalon and Parkside elementary schools, and Lely High School. Elementary school children must be 5 years of age by June 1 to take part and the hours of operation vary based on the school. The camps are scheduled from June 8 through August 14 at all locations. 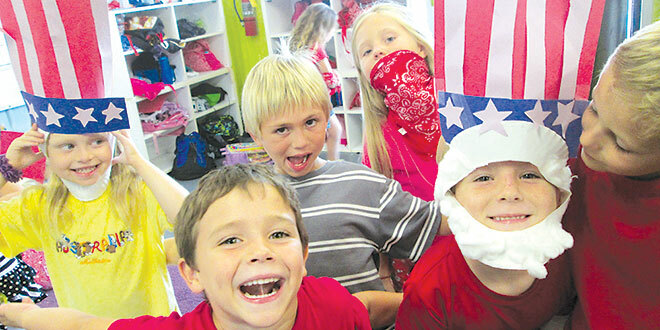 The camps offer weekly field trips, special guest visitors, weekly themes and more. On Marco, the Y summer program will run from 7 AM- 6 PM. The cost is $80 a week for Marco Y members and $90 a week for non-members. The weekly rate for Marco Y members’ siblings is $70 a week. The daily drop-in rate for Y members is $20, and $25 for non-members. The full summer rate for Y members is $700. There is also an assortment of specialty sports camps for baseball, basketball, football, Seibukan Karate, Tennis ‘N Splash, volleyball and Challenger British Soccer. These camps have additional fees. Enrollment in the camp program has been rising over the last few years, said Stephanie Pepper, the Marco Y’s Youth Development Manager. For information on the Marco Y’s summer camps, including scheduling, or to register, visit www.greatermarcoy.org/index.php/en/ or call 239-394-3144.